For some reason, one of our articles that gets a lot of links is our expose on the Male-Female unemployment gap back in late 2011. The reasons for that gap? Well, you surely recall the recent “Great Recession”, which happened to cause a lot of employment damage in the Construction and Finance industries, which were (and are) historically male-dominated. The interesting trend from that article was actually the chart which showed that the last few recessions have also hit male-dominated industries. 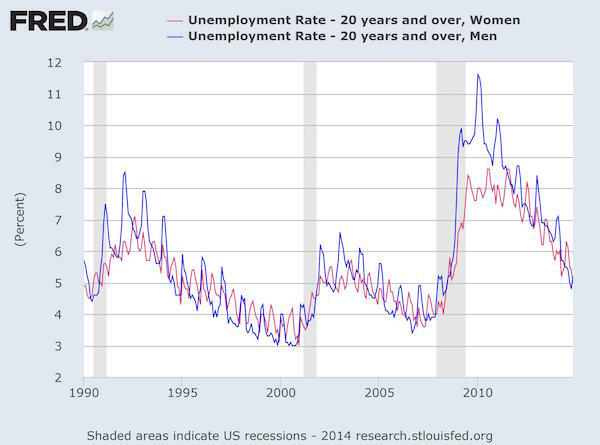 So, let’s take a new look at the 20+ male and female unemployment rates through November 2014. Pretty interesting to see that the last few recessions have gone the same way – with male unemployment first spiking (remember, this is non-seasonally adjusted) before recovering to parity. Any theories? What industries might see the next recession? The peak gap there around 2010 was pretty wide, whats that ~3% difference? I’m assuming that was mostly construction jobs. Lots of jobs in construction and they’re overwhelmingly male and that industry was hit with >20% unemployment. Jan ’10 – 11.6% male > 20, 8.0% female > 20. And 2000 – tech, another male dominated industry. For whatever reason, conditions have been pretty harsh on the male industries in the last few recessions. We’re already starting to see markets pricing in future pain in energy — hard to see that not making its way to industry and employment soon enough, and that definitely is a male-dominated field as well. That said, I don’t think it’s crazy at all to think construction will again be a part of the next big jump in unemployment… whenever that may come. I could see it getting hit again, or maybe a round two taking out a number of positions in tech or finance again. Of course, it’s impossible to say exactly – or, hey, investing would be one of those fish in a barrel situations.